Problogger is a great resource. If you’re thinking of starting a blog this is the first place you should visit. Darren is one of the best and he practices what he preaches. Not only is Problogger successful, Darren has other successful blogs including one of the best digital photography websites in the world. The man understands what it takes to be success with a blogging strategy. Recently, Darren polled his subscribers and something very interesting stood out. One of the biggest challenges facing bloggers is finding time to blog. Challenges and problems faced. The biggest challenges readers identified as having were finding readers, monetization, and finding time to blog. Not a lot of change here from last time although the “finding time” response was a bit higher. The entire post is a quick read and there is good insight including Darren’s main takeaway, which is that too few bloggers use email as a marketing program for their blog. Darren understands the power of an email list and recommends all blogs have a subscriber option for email. Back to the issue of time. Here are a few time hacks I have for struggling bloggers. Loving to blog helps when it comes to finding time to blog. There really is no secret to finding the time. You’re human. If you aren’t in love with something you’ll come up with a reason not to and it only takes one reason that’s somewhat legitimate and boom…no blogging today. That’s how we all operate. When something is difficult we simply don’t do it unless there is a reason that pushes us past our resistance. I enjoy blogging so it’s easy to find the time to blog, but there are times when I need to push. I play a few psychological games with myself in order to finish blog posts. These games date back to my childhood and they are still just as effective today. Back when I was a kid – about 10 or 12 years old – my parents would have things to do on the occasional Saturday. My dad would sometimes have to work and my mom would run errands. Like most 10 year olds I did not like running errands so I would choose to stay home. For some kids this might mean all day videos games, but not in my parents’ house. For me this meant a list of chores. My mom would leave to run errands and I would be home with my brother. We’d have chores to finish. Things included vacuuming the house, cleaning the kitchen, raking leaves, cutting the grass, etc. As you would imagine, I did not like these tasks all that much. I could think of a million reasons I was “too busy” and had “no time” to do these things, but I got them done. I would reward myself by saying that once I got everything on the list accomplished I would then have the entire rest of the day to do whatever I wanted. This reward was the drive I needed to finish all the tasks. Blogging can work much the same way. Reward yourself with things you love. This could be allowing yourself time to watch your favorite TV show or perhaps having dinner at your favorite restaurant. Tell yourself that you can do those things once you finish you blog post. Rewarding yourself is an old trick your parents probably used on you and it might seem immature, but it works. You may have caught the L-word in the first blogging time hack. I love lists. People love lists. I don’t know what it is, but lists work. Anytime I have a list of to-do items on my desk it drives me nuts. I can’t stop working until everything on the list is done. I can’t sleep. I can’t think about anything else until each item is crossed off. Even if I have ten blog posts to write I will write them down on note cards. I’ve become pretty good at estimating time required to write posts. I don’t try to give myself too much to do in one day, but I do push myself. It feels good to cross items off the list. I create one almost every day to accomplish things. I don’t know if there is psychological evidence to support lists, bu it works for me. My favorite time for being productive is in the morning. Some people think I’m a freak because I wake up at 4:30 a.m. every day. Even on the weekends I will “sleep in” until 5 a.m.
For whatever reason, I wake up feeling alive in the morning. I think it’s something genetic from my grandfather who always woke up early dating all the way back to his time growing up on a family farm in Wisconsin. I have energy in the morning. I’m the opposite at night. I’m worthless after about 9 p.m.
As a result, I write when I’m awake and that is in the morning. I find this is when I have the most mental energy to focus on blogging. There really is no point to pushing myself at night because there is no chance I’ll get anything done. You have to write when you’re awake. The thing is…you will find reasons to not do these three things. It’s how we all operate. We find excuses for everything. 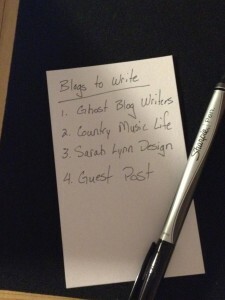 You have to trick yourself out of these urges if you want to blog. The only other option is to realize that blogging just isn’t for you and if you really think your business needs to have a blog in order to build a community and profit then you’ll have to hire someone that is crazy and loves to blog. These three blogging time hacks work well for me. There could be others that work better for you, but you should give these a try if you’re struggling with finding time to blog.